You can achieve color and texture in your landscape with out depending on just perennials and annuals. Spice things up with a wonderful mixture of tropical plants that will thrive and live up to a hard frost. Some of my favorites are the Neon Pothos (awesome! 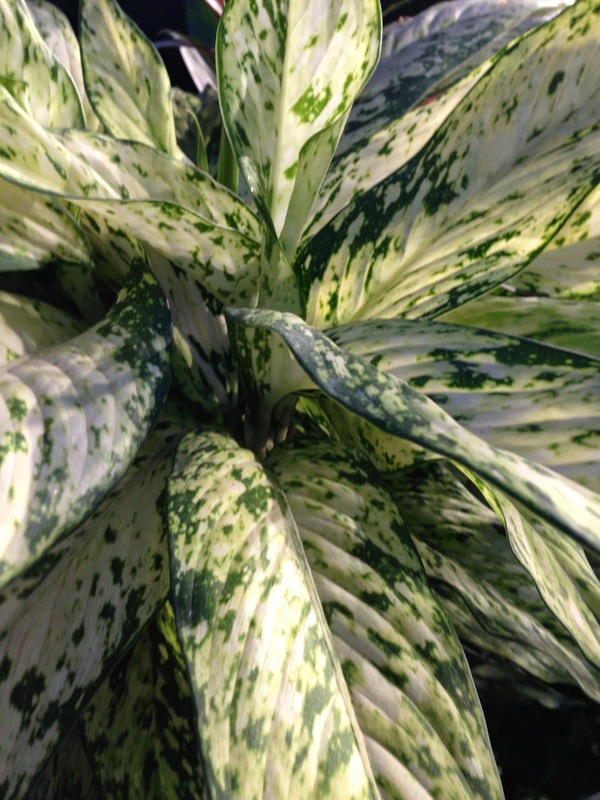 ), the Snake plant, different varieties of the Chinese Evergreen family, crotons, Bird Nest ferns, and even the variegated Ficus. Just mix these varieties into groupings of each kind and you will have one spectacular landscape. Who knows, you may just win the yard of the month. Mother's Day is just around the corner, and it's time to be thinking about a very special gift. Why not create a bling bling vase that is full of sparkle and may be filled with something special! Take any type of vase. We used a cylinder style Terra-Cotta vase. Now it's time for the bling bling! Your mother may have some costume jewelry that she never wears which would be great. If not, any antique mall or even a craft store has jewelry that may be used. At your local hardware story, you will find a pre-mixed adhesive and grout mixture that you will apply to the outside of the vase using a plastic knife. Simply layer the adhesive add add the costume jewelry. Allow to dry overnight. We also used colorful beads for an extra pop of color. Present your mother with this bling bling vase filled with some happy flowers! With Mother's Day around the corner, creating coffee filter flowers will be a great project to make with the kids! You will need a package of coffee filters, wooden skewers, green garden tape, food coloring/and or acrylic paint. Take one coffee filter and fold into thirds. Roll this coffee filter into a tube (the center of the flower). Take another coffee filter and roll around the center of the flower. Repeat this step until the flower is full. Hot glue the center of the flower to the other rolled coffee filters. Poke the wooden skewer into the center of the flower and secure with hot glue. Completely wrap the wooden skewer with green garden tape. Next, dip the flower into a bowl filled with food coloring and water. The coffee filters will absorb the colored water. Allow to dry overnight. You may also use watered down acrylic paint in any color. When entertaining, whether for lunch or dinner, it's always nice to have place cards awaiting your guests! A super simple idea is to take a clear plate (glass or melamine) and decoupage a place card underneath the place. Be sure to glue the name side of the card directly underneath the plate, so the name appears correctly. Place the plate on a fun placemat for the name to really pop! Another idea is to take a small terra-cotta pot, fill with styrofoam, place a spoon or fork's handle into the center of the styrofoam, and fill with moss. Either hot glue the place card directly onto the spoon or slip the place card in between the tines of the fork. In the wedding section of any craft store, there are packages of place card holder. Any item may be turned into a fun place card that may also be given as a favor. For instance, a spool of colorful twine, or any object may be used to create place cards. Now that the cold is over for most of us, its time to plant your landscape with colorful flowers that will give you enjoyment for the next 7 to 8 months. There are so many different varieties of seasonal color on the market so what do you chose? I can make it easy for you with my 10 top picks. Easter is this week and its time to get ready and decorate your Easter Eggs. There are so many new products on the market that can make your Easter egg dying simple and stylish. You can now have Easter eggs that are custom design with gold leaf and even ways in which you can hand draw custom designs on them. Endless possibilities!!! Don't forget your Mom this coming Sunday. Mom's want to know that you care so why not give your Mom a gift with thought. If your Mother is a gardener then don't just give one item but a gift that is a collection of different garden related accessories. Why not give a gift pot stuffed with an assortment of plants, a outdoor pillow, a garden stake, a gift certificate, and even jewelry with a garden theme. Endless possibilities!!! I always say when you replant your containers for the spring and summer to "Crame It and Shove It" full of an assortment of plants. Mix and different colors and textures and remember to make your pots look like living floral arrangements. You want the "What the What" factor. This means you want to create a potted container that looks so lush and beautiful that it will stop any person passing by stop in their tracks and take notice and enjoy. Plant roots eventually fill containers and this often reduces growth. This is not necessarily a bad thing as slightly stressed plants are often attractive and the slower growth reduces the maintenance needed. However, eventually the plant will need to be moved to a bigger container or the compost refreshed in the same pot, as composts lose their structure over time. Shrubs and trees that stay in a pot for years are especially vulnerable unless re-potted. In years when re-potting is not carried out, topdress by removing 5cm (2in) old compost from the top of the pot and replacing with fresh compost. Plants in containers need attention all year, but summer is the most critical period as plants can soon run short of water and nutrients. In winter, the main danger is compost freezing, which may kill plants. Over-watering is the most common cause of loss of container plants; watering should aim to keep the compost moist, never soggy and avoid alternating dryness and saturation. Plants grown in containers suffer from many of the same pests and diseases as when grown in beds and borders, such as aphids, algae, liverworts and moss and scale insects. Vine weevil and fungus gnats are particularly common pests of container-grown plants.